This is a feature specific walkthrough on how to setup and use a referrer groups to set allowed website referrals. The feature restricts access to your streams, so it can only be watched when embedded on your own web pages. First, you will want to create a Referrer List. To do this, click PREFERENCES and then scroll down to VIDEO SECURITY. You should get the following screen, circled in red being the area of interest dealing with referrer groups. In the circled area, you can see a list of previously created referrer lists (drop down menu) with the ability to EDIT an existing one or CREATE a new one. In this instance, click CREATE. URLs should look like “www.dacast.com“, so no “http://” part. After you are done entering a URL, click on the white area to have it be added. Click the X if you need to remove it. Please note that you can put in specific URLs, such as “www.yahoo.com/mysite”. You can also do broad URLs, for example all pages found on “www.dacast.com” would be covered when entering in that address. When finished, click SAVE. If you need to create more, you can add them in otherwise click the X. In order to utilize this, you have two options. The first is to set it up so all feature live channels and VODs you create will use this referrer group. To do this, stay on VIDEO SECURITY. 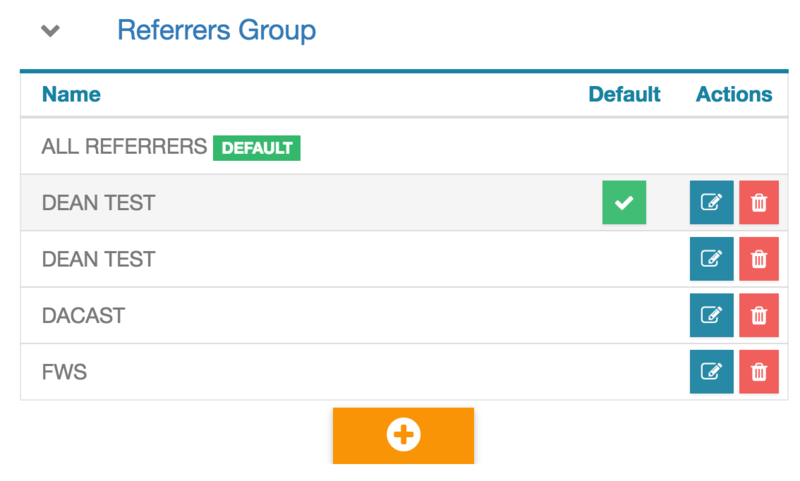 Use the drop down menu next to referrer group to select the list you want to use. This referrer list will be applied to all future content you create on DaCast by default. If you want to change a referrer list or add one to an existing channel or file, you will want to select that video and go to PUBLISH SETTINGS. There is a field here called REFERRER which is a drop down. Select the list you want to use for this video and click SAVE to confirm. Once a channel or file is using a Referrer List, it will restrict other websites from trying to use your same embed code to play the video.